The post Giant Slow Cooker Meatballs appeared first on Budget Bytes. I don’t know what it is with me and meatballs lately, but here we are again. #sorrynotsorry This weekend I made these deliciously Giant Slow Cooker Meatballs, which are a fun way to change up a simple spaghetti and meat sauce dinner. 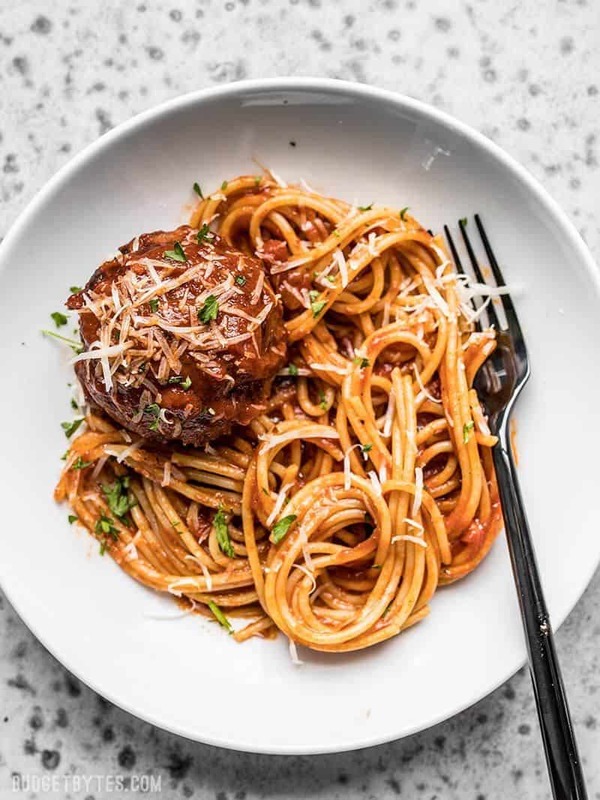 The whimsically large meatballs simmer away in marinara, the flavors from each seeping into the other, creating a luxe rich sauce for the spaghetti. And I’m telling you, the smell these meatballs create in your house as they cook is almost reason enough to make them! This is a great dish to meal prep for the week ahead! The pasta, sauce, and meatball package up quick and easy, reheat like a dream, and you can add a simple side salad (in a separate container) for each day. Done and done! Serve your Giant Slow Cooker Meatballs and spaghetti with a simple side salad and some Homemade Freezer Garlic Bread! As easy as 1-2-3, these Giant Slow Cooker Meatballs are a fun, easy, and effortless answer to weeknight dinner.